On Thursday the S&P500 extended Wednesday’s breakout above the 50dma. Despite escalating tension with North Korea and a category four hurricane, stocks continue trading near all-time highs. As I’ve been saying all month, a market that refuses to go down will eventually go up. That is exactly what is happening here. Even though the news flow has been overwhelmingly bearish this month, stocks have barely budged from record highs. At our deepest and darkest period in August, we were down a whole 2% from all-time highs. Bears were giddy with excitement and kept telling us to wait for it. But the crash never happened. That shouldn’t come as a surprise to anyone who reads this blog. Market crashes are breathtakingly fast, not drawn out affairs. If the initial headlines couldn’t knock us down, the follow-up headlines were even less likely to do so. It all comes down to simply supply and demand. The first North Korea headlines scared off the traders who fear such a thing. The next time those same headlines popped up, there were fewer people left to sell the recurrence. Instead, these fearful sellers were replaced by confident dip buyers who demonstrated a willingness to hold the risk. This churn in ownership is how news gets priced in and why it stops mattering. Tuesday North Korea launched a missile over Japan, but paradoxically that was our buy signal. Everyone who feared those headlines had already sold and the market was setting up to bounce on tight supply. We capitulated early Tuesday and have been racing up ever since. Nervous and fearful traders were wary of what they claimed was weak market. But they got it exactly wrong. Withstanding the relentless barrage of negative headlines confirmed how strong this market was. If we were vulnerable to a collapse, any one of those headlines would have sent us tumbling. The fact we stood up so well tells us this is a strong market, not a weak one. In all my years of trading, one of the most reliable trading signals comes from identifying what the market is NOT doing. Despite all the headline uncertainty, this market was not tumbling. That told me there was good support behind these prices and the path of least resistance remained higher. That told us the latest drop in price was still a dip buying opportunity. The last few weeks of selling purged many weak owners from the market and replaced them with confident dip buyers. This firmed up support and this bull is even stronger than it was last month. 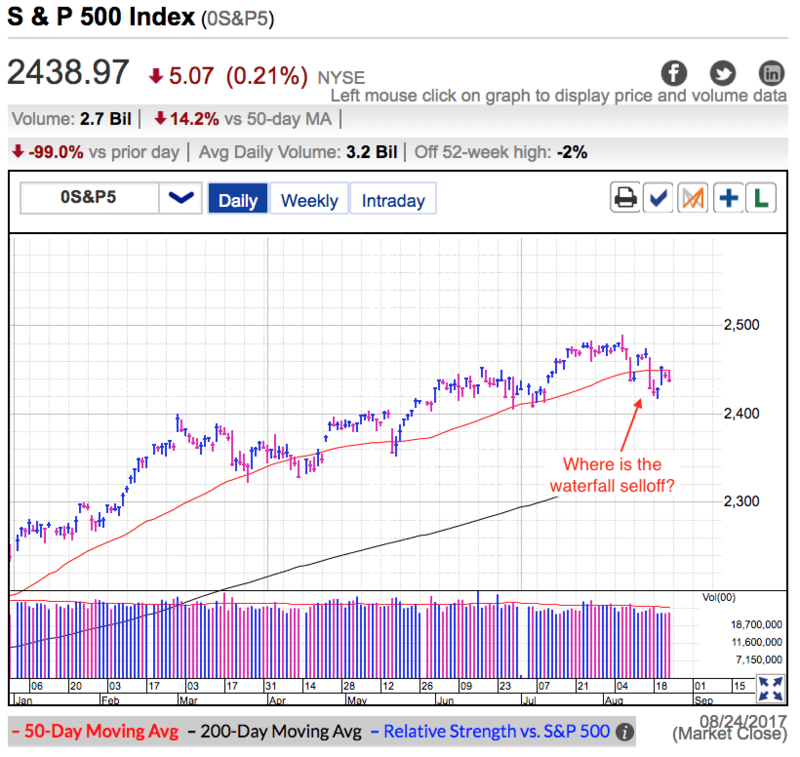 This base building process is setting the stage for the market’s next move to all-time highs. The path of least resistance remains higher and 2,500 is easily within reach. From there we need big money to start buying to keep the rally alive. The market is up around 10% for the year. While this has been slow this summer, I don’t expect that to last. Volatility is already picking up and that will continue through the fall. While many bears warn about downside volatility, I actually think bigger risk is upside volatility. Many cynical money managers are underweight this market and they have been patiently waiting for a pullback. The latest 2% dip is about as good as it is going to get. When they realize this market is far more resilient than they thought, they will be forced to chase prices higher or else risk explaining to their investors why they lagged behind the indexes so badly this year. That desperate chase for performance is going to fuel a strong rally into year-end. While that is the most likely outcome, there is a chance Trump and Republicans fumble tax reform and the market uses that as an excuse to take profits. This could lead to a wave of reactionary selling that drops us near breakeven for the year. That said, this is a low probability event because the fumbling, bumbling Republicans cannot get anything done and expectations for tax reform are already quite low. I doubt many people will be surprised if Trump and the GOP get nothing accomplished this year. That lack of surprise means we won’t see much of a selloff. If we were vulnerable to high expectations, we would have seen a much stronger reaction when the Senate failed to pass healthcare reform. This is an incredibly strong market that is ignoring every excuse to sell off. Keep doing what is working. Stick with your buy-and-hold positions and buy every dip until further notice. Free blog posts are published Tuesday and Thursday evenings. Signup for Free Email Alerts and be the first to read my latest analysis. A market that refuses to go down…. Tuesday was a wild ride for the S&P500. We gapped lower at the open following North Korea’s provocative firing of a missile over Japan. But rather than devolve into another spiral of relentless selling, we bounced off the early lows and actually finished the day with small gains. It was a shocking reversal for everyone who automatically assumed the bottom falling out of this market. I’ve been saying for weeks, the path of least resistance is higher and today’s resilience confirms that outlook. Headlines have been overwhelmingly negative in recent weeks. An escalating war of words between Trump and North Korea. A revolving door of senior advisors in the Trump administration. An exchange of sharp barbs between Trump and senior Republican leadership following the Charlottesville tragedy. The worst natural disaster to hit U.S. in over a decade. And now North Korea moving beyond words by launching a missile over Japan. If anyone knew the barrage of negative headlines that was coming, they would certainly expect the market to be dramatically lower. Yet here we stand, less than 2% from all-time highs. What gives? Most traders focus on what the market is doing. But I find it far more insightful to see what the market is not doing. That is a far more predictive indicator of what the market’s next move because it exposes the crowd’s false assumptions. In this case, that we are vulnerable to a collapse. If we were going to crash, it would have happened weeks ago. It doesn’t take much to trigger an avalanche of selling when the market is fragile. Yet the last few weeks we withstood headline after headline. We slipped a bit and nervousness definitely spread through the crowd, but prices barely budged. For anyone that was paying attention, that resilience told us we were standing on solid ground. And each day of selling further firmed up support as nervous owners were replaced by confident dip buyers. Rather than get weaker, this market has been getting stronger. And today’s flaunting of the North Korean missile story confirms that analysis. This reversal is as bullish as it gets. While I’d love to see us race ahead, sideways churn is just as constructive. The market isn’t following anyone’s timeline, but trust me, a market that refuses to go down will eventually go up. Trade against this strength at your peril. 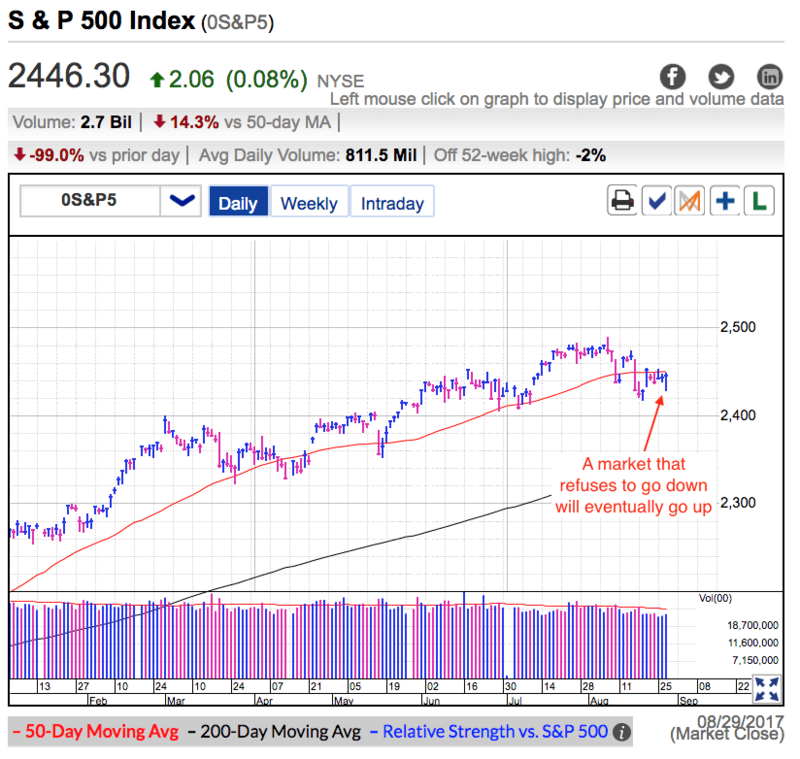 On Thursday the S&P500 lost ground for the fourth-time out of the last six-trading sessions. Fear over an armed conflict with North Korea morphed into fretting over debt ceilings and bond defaults. These latest issues were brought to the forefront two-nights ago when Trump threatened to shut down the government if Congress doesn’t fund his wall. These relentless waves of bearish headlines over the last few weeks has weighed on market sentiment. AAII’s latest investor survey shows a 6-point loss in bullishness and a mirror image increase in bearishness. The bull-bear spread is nearly 20-points under its historical average as a large number of investors are preparing for the worst. It is easy to see why pessimism jumped in recent weeks. Tension with North Korea, key members of the Trump administration forced out, barbs exchanged between Congressional leaders and the White House, and now swelling anxiety over a government shutdown and default on U.S. debt. Without a doubt this market should be in freefall. Yet eight-days of losses over the last three-weeks only managed to knock us down 1.6% from all-time highs. That’s hardly the panic driven selling you would expect given the headlines. What gives? Bears claim we are on the verge of imploding. They figure it is only a matter of time before this complacent market finally wakes up. But here’s the rub, everyone already knows about these issues because it is front page news. If a group of investors is blissfully unaware, then they have their head in the sand and are unlikely to figure it out any time soon. Not only that, the dramatic swing in investor sentiment tells us these headlines are definitely affecting people’s mood and outlook. Is there any truth to the bear’s argument that the collapse is coming, even if it is a little delayed? In all my years I’ve never seen the market ponder headlines for several days before finally deciding to plunge. It would be great if the market gave us that much time to analyze the facts and make a thoughtful and deliberate sale before crashing. Unfortunately that’s not the way this works. Market crashes are frighteningly fast and if you stop to think about what is happening, you will get run over. Market crashes are most definitely sell first, ask questions later events. The simple truth is if the market cared about this crop of headlines, we would have crashed by now. Without a doubt this market is complacent, but the thing conventional wisdom fails to tell us is complacent markets last far longer than anyone thinks possible. This bull market will die at some point because all bull markets eventually die. But this market’s limited reaction to these waves of bearish headlines tells us this is not that time. If anything the recent bout of negativity and string of down days is firming up support. Every nervous seller is being replaced by a confident dip buyer. This churn in ownership is strengthening this market and setting the stage for the next move higher. I am definitely not a raging bull and have a lot of concerns about this market. But I have been doing this long enough to know a market that refuses to go down will eventually go up. Don’t fight what is working.